The CCDC organizes a wide variety of events for Clarksville residents. The events are a fun way to help build a sense of community in the neighborhood and to share information about Clarksville’s very special history. They also offer residents opportunities to meet their neighbors, give back to their community as event volunteers and fundraise for the organization. This event happens at the Haskell House, 1703 Waterston Avenue. Targeted toward kids 8 years old and under, the haunted house features creepy, but fun activities, like a witch stirring a steaming cauldron, a graveyard, lots of ghosts, and scary sounds. The Fun Fest is the CCDC’s major fundraiser. 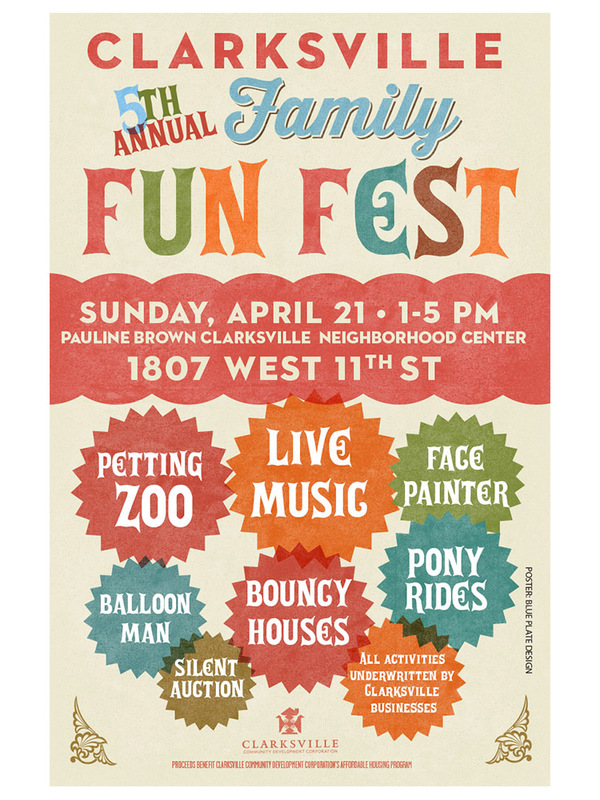 It takes place on a Spring afternoon at the Pauline Brown Clarksville Neighborhood Center. The event features lots of fun activities for children, live music, a silent auction, and lots of great food. Local businesses and individuals underwrite the costs of the Fun Fest. At our ice cream social, Clarksville residents enter their homemade ice creams in our “Best Ice Cream in Clarksville” competition for the chance to win the coveted “golden scoop” award and other prizes. People vote for their favorite ice cream after sampling the entries. This joint CCDC/Old West Austin Neighborhood Association (OWANA) event happens during an evening in December. Neighborhood residents gather at the Haskell House for food, drinks and conversation while Santa and Mrs. Claus talk with the kids. Later, everyone strolls through the neighborhood singing Christmas carols. The CCDC in partnership with Texas Parks & Wildlife’s Buffalo Soldier Heritage and Outreach Program sometimes sponsors Buffalo Soldier encampments on the grounds of the historic Haskell House. During the event, which is targeted toward Mathews Elementary School students, but open to anyone, Buffalo Solider re-enactors share stories about the little known former slaves, who served in the U.S. infantry supporting the Westward expansion of this country after the Civil War. They also fought in the Spanish-American War as well as both World Wars.